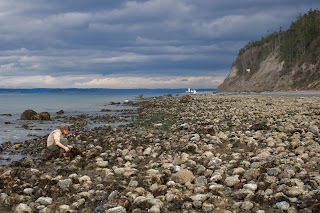 We spent the later part of Wednesday at North Beach collecting beautiful rocks and searching for interesting critters to put in our tanks before re-opening in April. Chrissy and Keith volunteered to snorkel despite the cold temperatures and low visibility. 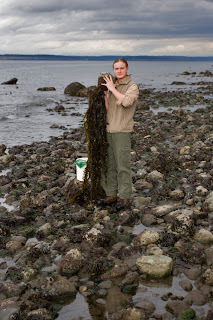 Liza, Cheqa (our high school intern) and I hobbled along the rocky shoreline as the tide slowly came back in. While assisting our snorkeling team we searched for crabs, limpets, chitons, unique snails, nudibranchs and other small animals under rocks. Cheqa found a feather boa attached to a rock that will be a great addition to one of our tanks. The snorkeling team also found a Sea Lemon Nudibranch and some rocks encrusted with sponge for it to feed on! We will collect again before we re-open in April and could use 1 or 2 volunteers to help carry the heavy buckets! The other animals we collected will remain a mystery until you visit on opening weekend in April! 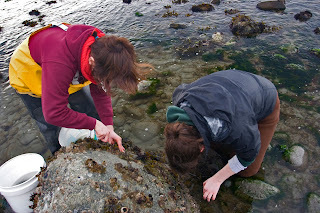 Allie and Liza collecting chitons. Cheqa our wonderful high school intern. Cheqa holding a feather boa! All pictures were taken by Jason Green.